Aubameyang: "BVB are a massive club"
Bad Ragaz - When the offer arrived for Pierre-Emerick Aubameyang to join Borussia Dortmund, the 24-year-old needed no convincing whatsoever. “It was an easy decision. I came here because BVB are a massive club that can help me become a better player,” said the former AC Milan forward in his first official press conference since joining the Yellow Blacks from AS Saint-Etienne. Linking up with the UEFA Champions League finalists can be considered a step up from playing for Saint-Etienne, who finished in fifth place in Ligue 1 in 2012/13. 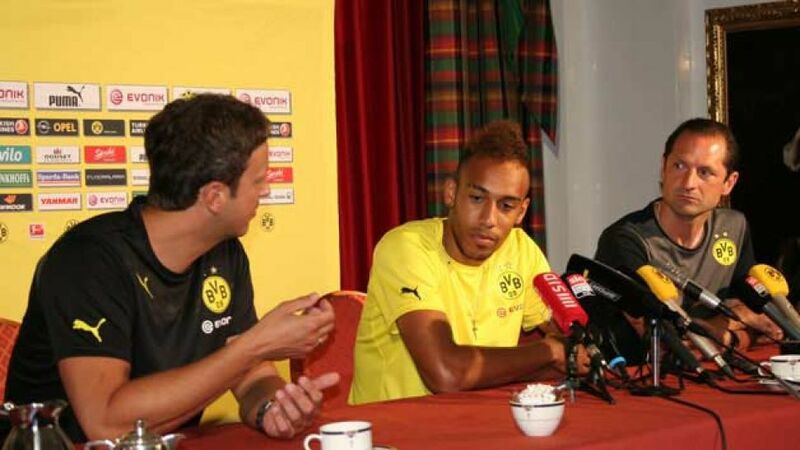 However, Aubameyang isn’t worried about making his own mark in Dortmund. “I don’t see myself having any difficulties playing here because this team is full of world-class players." One of those stars is fellow newboy Henrikh Mkhitaryan, with whom Aubameyang has been particularly impressed. “Micky is a world-class player,” he says of the Armenian international. The two of them, who communicate together in French, both turned in excellent displays during Saturday’s 4-1 friendly win over Bursaspor, in which Aubameyang grabbed his debut goal from a Mkhitaryan assist. Mkhitaryan isn’t the only one being schooled on what it means to play for BVB. Aubameyang is also a willing student, but instead of die-hard club fan Kevin Großkreutz being his mentor, the Gabon international is undergoing a more laid-back introduction from midfielder Ilkay Gündogan. His first chance of doing just that will be during the Supercup, when BVB host defending league and DFB Cup champions FC Bayern Munich on 27 July.